The other day, Mr CTC and I were entertaining the parent-types. We decided on a walk, followed by - you've guessed it - a stop in a teashop. Imagine my excitement when I saw the Vintage Cupcake Kitchen in Uppermill! It is, I believe, quite a young eating establishment, but it is already thriving and extremely popular. We went on a busy Sunday afternoon, and it was heaving! Luckily, the lovely sunshine meant we could sit outside on the dog-friendly terrace, so our dog was included in the fun. Unusually for me, I didn't fancy a cream tea (I must have been coming down with something), but Mr CTC didn't let the side down. There was a choice of a 'deconstructed' cream tea - i.e. 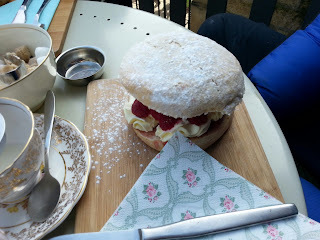 : how we normally have it with scone, butter, cream and jam, that you assemble yourself, or a 'made-up' cream tea, where the scone was already loaded with cream and jam. The addition of fresh fruit (strawberries or raspberries) was a thoughtful and welcome extra. When the food arrived, I was shocked at the size of the scones! They were ridiculously huge! The scones were freshly baked, but cold and un-fruited. But, they looked absolutely delicious. The cream was perfectly clotted with a crust, and the jam provided in cute little jars. 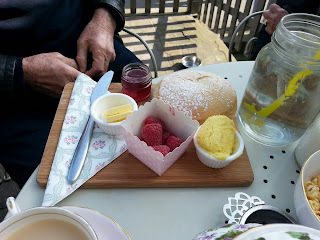 The already constructed cream tea was also scrumptious. It had to be eaten in wedges like a cake. The cream was fresh not clotted, but nonetheless, got the thumbs up from Mr CTC. I am a real sucker for the retro styling and pretty napkins. The crockery was beautiful vintage bone china, and I thought that if I ever run a tearoom, I would do it like this. In addition, the other food available on the innovative and interesting menu was very good too. My mum had a soup and I had a cupcake (I couldn't not), which was as good as it looked. It was soft and creamy with lots of sweet icing. I definitely couldn't have two. The Vintage Cupcake Kitchen is now on our map of tearooms, and we will be making a detour there again, hopefully very soon!